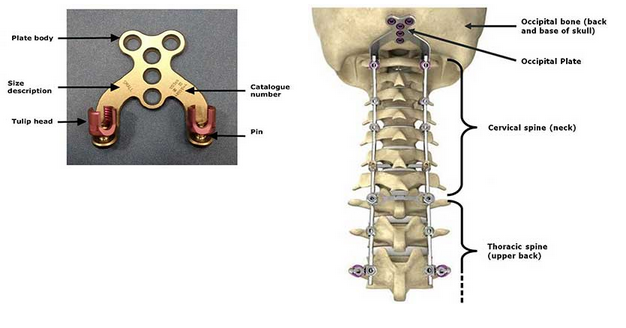 The defective product, the OASYS Midline Occiput Plate, is a specific part of the OASYS system which is used in spinal surgery to promote fusion and provide stabilization at the junction between the occipital bone and the vertebrae in the cervical and thoracic spine (see picture below of the plate and of the whole OASYS system installed on the spine). According to the FDA, the pin that connects the tulip head to the plate body can break after the surgery has been performed which may cause serious adverse health consequences including blood loss, nerve injury, and the need for revision surgery to replace the fractured implant. Class I recalls are issued by the FDA for dangerous or defective products that predictably could cause serious health problems or death. The defective batch of medical devices was distributed between April 23, 2010 and February 12, 2013 and currently 1,536 devices are in still in commerce in the US and 800 abroad. Surgeons who installed an OASYS Midline plate in their patients during this time frame should inform their patients and perform regular clinical and radiographic post-operative evaluations. If a patient experiences pain weakness and numbness it may be the sign of a broken pin and an immediate evaluation is needed. Patients who have received a defective implant or have been injured by a defective implant should seek legal representation. This is another blow for Stryker who had been recently dealing with major lawsuits after a recent hip implants recall.